Three days after winning Sandown’s Sunderlands Imperial Cup, the David Pipe-trained Gaspara earned his connections a £75,000 bonus after running away with the concluding Fred Winter Juvenile Novices’ Handicap Hurdle. The bonus was put up by Sunderlands for any horse winning Saturday’s race and an event at the Festival. 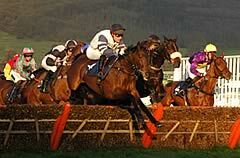 It was also won in 1993 by Olympian and in 1998 by Blowing Wind, trained by Pipe’s father and Gaspara’s owner Martin. "You couldn’t write this could you,” said Pipe junior. “We lost Little Brick earlier in the day [he broke his shoulder in the William Hill Trophy Handicap Chase], which was a massive blow for everyone in the yard, and now I’ve trained my first Festival winner and it’s owned by my father. "It hasn’t sunk in yet - it’s an amazing feeling and everyone wants to win here. I’ve done it once and want to experience it again. "The idea was to jump out and make it - there were quite a few that were going to make it, but they didn’t and Andrew [Glassonbury] did the right thing in sitting where he was up front. She’s very tough." Martin Pipe was delighted to see his colours carried to victory and admitted: “This always was in the back of our mind and it seems the handicapper was right to put her up 12lb but I told everyone she was 13lb well in today! Trainer Gary Moore was very happy with the performance of Althilhar, the five-length runner-up behind Gaspara in the Fred Winter Juvenile Novices’ Handicap Hurdle, the concluding race on day one of The Festival 2007. The Dynaformer gelding kept on well to take second in the final strides, but was no match for the easy winner. Brighton-based Moore quipped: “I think the winner is a very decent horse. “I think only one trainer could have won the Imperial Cup on Saturday and then come out and won today with the same horse. I’d have given the winner a week off! “My horse has run a good race. I had questioned whether we should have run today as I thought it might be a bit soft for him but that has not proved to be the case. “I will have to speak to the owner before we decide where he goes next. 1. The Fred Winter Juvenile Novices’ Handicap Hurdle commemorates the late Fred Winter, one of the greatest figures in the history of jump racing both as a jockey and as a trainer. Winter, who died aged 77 in April, 2004, was champion jockey four times and rode the totesport Cheltenham Gold Cup winner twice (1961 Saffron Tartan, 1962 Mandarin) and won the Smurfit Kappa Champion Hurdle on three occasions as a rider (1955 Clair Soleil, 1959 Fare Time, 1961 Eborneezer). He had 17 Festival successes as a jockey. He retired from the saddle at Cheltenham's spring meeting in 1964 and went on to be champion trainer on eight occasions. He won four Champion Hurdles as a trainer (1971 and 1972 Bula, 1974 Lanzarote, 1988 Celtic Shot) and, although the Cheltenham Gold Cup proved elusive for a long while as a trainer, he finally landed the race in 1978 with Midnight Court. He saddled a total of 28 Festival winners and holds the unique feat of having been the only man to have both ridden and trained winners of the Cheltenham Gold Cup and Champion Hurdle. 2. The Fred Winter Juvenile Novices’ Handicap Hurdle was one of the new races introduced to The Festival in 2005 when it was extended to four days. 3. The inaugural running went to Dabiroun, partnered by Nina Carberry. Carberry became the second female jockey to win a Festival race other than the Christie’s Foxhunter Chase, following on from Gee Armytage.